I got a call from a fellow that I met a few years ago, at some farmers symposium or other. I know that it was a few years ago, because I stopped going to the majority of the events because they really didn't offer anything useful for me. Every now and then I hear about a session that I'm interested in, like the one on small grains in Washington State that Michelle attended recently, but that's the exception. Catching rainwater illegal: who knew? So I get this call, and I end up spending 90 minutes talking to him, and he's pretty funny, and has run a farm for a while, and we commiserated on various government issues. Like how he had to get a permit to catch rainwater off his roof, for instance. Turns out that he was one of the guys that was involved in drafting the regulations to allow it. Did you know you can go to jail for collecting rainwater? 100 dozen eggs a week? What he's calling me about is that his pastured egg supplier had gone out of business, or was selling the eggs somewhere else, it wasn't really clear, but he needed some eggs. In fact, he'd like 100 dozen eggs a week, and would I be interested? One of the things that I take pretty seriously is providing as close to a full-time job as I can to my farmhands, and I'm always looking for something that I can give them that both produces revenue for the farm and keeps them gainfully occupied. Since we sell a lot of animals retail, chickens and piglets, I have to have someone at the farm all day; for those days when we don't do much in the way of sales, it's nice to have them doing something. The alternative is to send them home, which, basically, cuts their pay. A better solution is to keep an eye out for tasks like this one might be. He tells me he wants 100 dozen eggs, and wants a mix of colors. He'd like about 10-15% of them to be green or white or dark brown, so that they can be visually different for the customers who buy them. If they were all uniform brown eggs they'd look like costco, and he wants that as a marketing point. He'd also like to have them packaged in his packaging and under his brand name. I'm ok with that. I'd like him to pick them up from the farm gate, and pay for the packaging; my end of the deal is to take care of the birds, collect, clean and package the eggs, and make sure they had access to forage and were in good condition. With the basics ironed out, I sat down with my spreadsheet and started on what I would have to sell the eggs for per dozen to make it worth my while. In my experience, chickens lay between 130 and 200 eggs per year per chicken. They lay more in the spring or when they first start laying, and less in the winter. You also can't count on 100% of the eggs to make it to market -- you'll need to produce a few more to allow for breakage and so on. Green egg layers aren't as efficient as white or brown, and white egg layers, specifically white leghorns, are the best egg layers of all. So if we add green egg layers we offset by the same number of white egg layers and average out the production. So to make 1200 eggs a week, we're going to need roughly 400 mature laying hens and those birds will produce about 1400 eggs a week on average, which gives us a basically 16 dozen extra eggs a week. So far so good. To get 400 hens, I'd have to be safe and order about 10% extra (mis-sexed chicks, non-productive hens, random mortality), so I'd need to make an order for about 440 female chicks. How much do hens cost? Ok. Green egg layers cost more as chickens, white egg layers less, brown somewhere in the middle. Figure an average cost of $2.50/chick, including shipping. That works out to be $1100.00 Chickens convert food to meat at a rate between 2lbs and 4lbs of feed per pound of chicken. A hen weighs about 4lbs when she starts to lay, so we'll need 4*4 or 16lbs of feed to bring the chicken from chick to point-of-lay. Chick starter is more expensive than layer feed, and feed in general is very expensive. So lets figure 440 chicks * 16 lbs of feed, or 7040lbs. That's 3.5 tons. "chicken feed" used to mean "cheap"
Right now commercial hog feed is $540 a ton. Chicken starter is $800 a ton. Chicken feed is $480 a ton. We'll need 1 ton of chicken starter and 2 tons of chicken feed to bring these birds to point-of-lay. That's $1760. to keep 440 chicks happy and warm you'll need three brooders, you'll need lightbulbs, and you'll need floor space. You'll also need feeders and waterers, and for this many chicks you'll need bedding and some labor as well. If you use my brooders and you use large-capacity feeders the labor is actually pretty small. You make sure that they have water, that the feeders are full, scan the flocks to see if any died, and that's about it. A little shed or horse stall works, or pretty much anyplace that doesn't have a draft. A tool shed. I'm going to ignore the costs for this equipment because I've already got it all. If you were to buy it, you'd need 3 5 gallon waterers, 3 brooders per the plans above, and probably 12 chick plastic chick feeders, graduating to 3 big rubber bowls as they start eating more. Think $500 and you wouldn't be too far off. figure 1 hour of labor a day, and don't forget you have to pay yourself. I figure labor at $15/hour -- who wants to work for minimum wage? It takes between 4 and 5 months for a chick to start laying. 5 months * 30 days = 150 days. at 1 hour a day that's 150 hours, and at $15 an hour that's a labor cost of $2250. So the costs up to this point, before you get a single egg you can resell, are $5,610. Now what does it cost you to operate? Figure 400 or so chickens will eat 1.5 tons of feed, at a cost of $720. Labor costs go up -- collecting, sorting and packaging 1200 eggs, moving the hens to new forage, and keeping fences up and predators away -- figure 4 hours of work a day, or $1800 a month. Hens don't care about weekends. We'll need a refrigerator so that we can keep all these eggs cool - or two, actually. There will be some time spent bookeeping -- we're selling them, so they'll be invoices and so on. Figure we'll get two years of laying out of our hens, so we need to divide the cost of bringing them to point of lay by 24, giving us $233 monthly cost, ignoring the cost of money itself. So our breakeven point is the cost of operation ($720 feed + $1800 labor) plus the cost of raising the hens ($233), or a total of $2753.00 per month. During that month we produce 400 dozen eggs, so if we divide our operating cost by 400, we get a cost of $6.88 a dozen at the farm gate. Lets say we want to make a 10% profit. That would put us at $7.50/dozen in round figures. Actually, it's not that bad. First, these are truly pastured eggs. The farm worker/farmer is paid a living wage that is competitive with other employers in the area = we can keep good people, and people who care about the animals and take their job seriously. We require no grants or other direct subsidies, and the impact on the land is pretty minimal with proper rotation of the chickens. We could save money by doing what most major retailers do -- pay people the minimum wage. That would cut the labor costs substantially. Or we could keep the birds in big barns and never move them onto new pastures -- lots less labor, less chance of predators. That's what most of the eggs you see in stores do- "cage free" almost always means "never sees the outdoors, ever". That's what fair food costs, folks. Would you pay that per dozen? First, this isn't going to go the way you think. I'm actually a fan of animal control officers and the role of animal control in the area. They do a thankless job that often involves conflict and at times, they are responsible for doing considerable good. Like when they run across a situation were animals are neglected -- often they're the only ones who can step in and get proper care for the animals. I do sometimes disagree with their management, but what I'm really disagreeing with is the laws or rules that they are saddled with, not with their intention. This is particularly true when I look at the horse rescue situation that consumes a considerable part of the budget of animal control around here. So the individuals involved in animal control, and the management of the shelters, and the volunteers who care for the animals -- hats off to you guys. Really. This is not sarcasm. Here's a post that I ran across on homesteadingtoday.com, in the goats livestock forum. "apparently we are irresponsible and neglect our animals. for the second time since we've had our goats, i guess animal control is being called. this time because out goats apparently dont have shelter. just cause you cant see it from the road... the first time was before we had fencing and we were tethering (we were home). from the road you couldnt see each goat's water bucket. animal control showed up that time and was very impressed with how happy our herd was, no problems. i'm sure they'll say the same again. 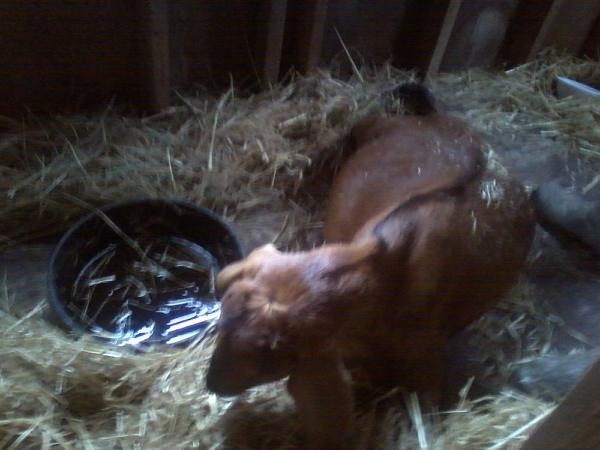 i mean, we have 4 goats on 10 acres, with fresh spring-fed creeks, and their choice between 2 sheds. i'm pretty sure they are content. not to forget, two weeks ago, as fern lay dying, the mentally retarded neighbor asks us " well, who hasn't been taking care of her?" people assume because we're young that we are just terrible people..
what do we need to do? offer tours of our farm? post signs at the road? "btw, our goats have food, water, shelter, and love." i am so ticked off right now its not funny... sorry about all the bad grammar, my hands are shaking. " The author of this post has a blog, and you can see pictures of her goats and setup; and she recently had a baby. First, congrats on the child, and second, sympathy for your issue. You are not alone. Lets talk a little about her questions, because I think she raises some interesting points. do we need to offer tours of our farm? People complain to government agencies, not just animal control, for a variety of reasons. In my case they have complained to the army corps of engineers, the county planning/development department, the department of ecology, animal control, the surface water management department and the department of fish and wildlife for the state over the years. The first thing that you have to realize is that not everyone cares about the animals. Some folks will complain because they don't like the animals being there. Or they don't like you. Or they don't like seeing the animals as they drive by. Or they think that your particular kind of animal shouldn't be around -- the horse owners in my area complain about my pigs, for instance. Their horses shy away when they ride by on the county road, and they don't like that. A tour isn't going to solve that problem, or stop those folks from complaining. The people who come on the tour will tend to be people who agree with you already. It's actually pretty nice to find folks who agree with you, and your blog, with lots of pictures and discussion of your animal care, will do much more for your public image than anything you might achieve with a tour. Do we need to post signs on the road? Michelle, who writes about sheep and dogs on her blog, has had an issue in the past with people writing her nasty notes and leaving them on her fenceline. She has dogs, and writes about her dogs now and then, and they look like they're having a good time. The complainer was making signs and posting them on Michelle's fence. In Michelle's case, this person repeatedly did this. Remember that complainers may not have your best interest at heart, or care for your animals. What they're after is to harass you, and if you post defensive signs it just brings more attention to it. I'd say no signs -- don't encourage them. Matronofhusbandry (her choice of names) writes a very popular blog, and has had issues with neighbors making judgements about how she manages her pastures and when her greenhouses got flattened by snow, they complained about her greenhouses, too. She does what I think is wise; just stay the course. Of course you'll make mistakes as a new (and old!) farmer - I still do, and every farmer I know does. Just stay the course. What you're doing by making sure your animals are well cared for is all the reassurance you need. First, work very hard to be polite and maintain good relations with whatever regulatory agency is called. It is very difficult to not be defensive, and in cases where there is an honest disagreement -- where you think you're right, and they're wrong -- it's worth it to stand up for yourself, because they won't go away unless you do. But in the case of things like animal control, being on a first-name basis with the local animal control officers, and having them know you and your practices, is your first and best defense. My farm is next to an elevated highway, and 55,000 cars pass by every day and look down into my farm. There are traffic jams that slow the cars down to 3mph, and 70,000 people look at my farm every day. For me, daily visits by animal control happened for months on end. They'd come to my driveway, I'd say hi, and ask what they wanted to look at, and I'd take them there. Dead pig on the compost pile? Naw, they like sleeping there. Lets go look. Sheep don't have water? Lets go look. Pigs sleeping in mud? Yep. They do that. Want to see? Personally? It was INCREDIBLY FRUSTRATING. I'd grit my teeth and just endure it, but it does get better. I hated being second-guessed about every single thing I did on my own farm. But it's important to note that your issue is with the complainers, not the agency. That's a clear distinction to make. After 2 years of that they rarely come to the farm any more. They're required by law to respond to every complaint, but they all know me, and they've all been all over my farm, and they've seen every single piece of it. So now if it's a novel complaint, they meet me on my driveway or call me and it's no big deal. I'm super-visible and I'm also the biggest pig farmer in this county. So for a lot of the agencies this was the first time they'd ever been to a pig farm, so I had a bigger education issue than most. I think you'll do fine with your goats; keep your resolve and ignore the haters. Deep litter is an animal housing system, based on the repeated spreading of straw or sawdust material in indoor booths. An initial layer of litter is spread for the animals to use for bedding material and to defecate in, and as the litter is soiled, new layers of litter are continuously added by the farmer. In this fashion, a deep litter bedding can build up to depths of 1-2 metres. 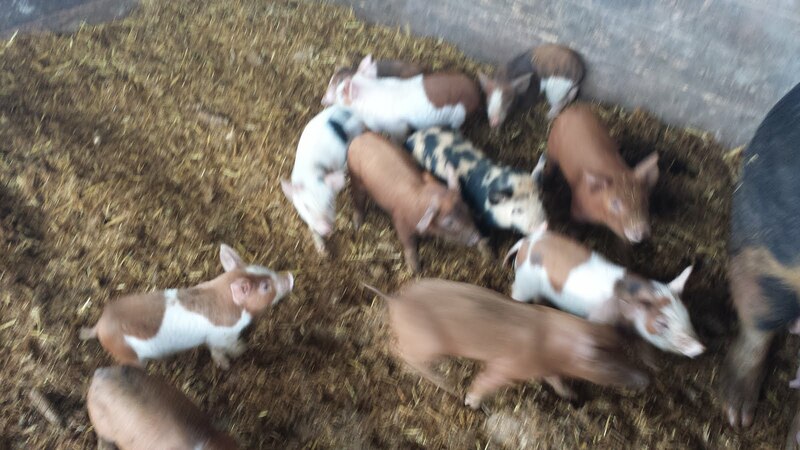 In the picture above you can see the pigs on the deep litter. I'm changing a couple of things from the definition -- instead of using sawdust, I'm using chipped trees -- and I'm also allowing the pigs outside access, so unlike a completely barn raised pig, these guys can go outside whenever they want. If I were to confine them I'd capture all of the manure and urine in the deep litter; as it is I figure i get a little over half of it. If you'd like to see what this barn looks like, look at this entry. The pigs enjoy the deep litter; choosing to spend their sleeping hours there, increasingly so as the weather gets colder. The concrete blocks at the back of this picture are 2' tall, each. So you're looking at 18-20" of wood chips here. I watch the condition of the wood chips, and when they get wet or matted I'll add more. At the end of the winter we should have between 3 and 4 feet of wood chips here. A surprise to me was that the wood chips have maintained a very warm temperature; a probe shows the chips at 104 degrees F / 40C, which is warm to the touch and has been sustained now for 3 weeks. The pigs react to this by making a shallow depression in the chips for their body -- so that it looks like the pig has melted into the ground a little. The bigger pigs don't do this as much -- the weaner pigs will bury themselves in it, and all you'll see is their noses. I think that's related to the amount of fat / insulation that the animals have. Because i'm allowing them out they can get wet and muddy, and I'd rather not have too much of that tracked into the dry litter of the barn. So I constructed a pathway about 50' long from their pasture to the barn, and this allows the mud and water to drip off the pigs as they make their way back into the barn. So far so good. The pathway fencing is a design that has worked well for me in the past. A series of hog panels supported every 8' by T posts, and an interior electric fence to keep the pigs from pushing on the panels. The pigs are very careful not to touch the electric fence, and so the panels stay in place. What you don't want a pig to learn is that a hard dash will get them past the electric fence -- the hog panels stop that behavior, and the electric fence keeps them off the panels. In the summer, for less crucial fencing, a single strand of electric fence works fine. In this case, the path to and from the barn is throug an area where we unpack and handle food, and the pigs are very interested in getting out; so this setup works to keep the pigs contained. A good fence allows you to sleep at night. I'm always interested in ideas, and things that involve compost really interest me as I've got a lot of compost, and one of the things that "got" me was the concept of growing things in an unheated greenhouse. This book talks about growing winter-hardy vegetables in an unheated greenhouse in Maine, which is considerably colder than Western Washington in the winter, and it covers a variety of topics. I think this book is aimed at people who want to have market gardens or to increase their utilitization of their land during non-typical seasons. The basic technique espoused is to have a hoophouse which provides some cover, and an inner crop-cover, which provides further protection. The author describes situations where the outside temperature is very low -- 10 degrees F or -12c, where the inside temperature at soil level is in the low 40s or high 30s. That's enough protection that cold-hardy vegetables will not be affected, and allows cropping of fresh vegetables during winter. What is of particular value, if you're considering doing this for a market-garden application, is the discussion of planting schedules and seccession planting. You plant the winter vegetables in the late summer or early fall, in waves. The maturation is slower than it would be in summer, but the spoilage is, too. So your salad greens have a longer harvest period. He talks about moveable greenhouses, mounted on skids, on specific types of vegetables that grow and sell well, and has useful notes on marketing vegetables and establishing a brand that consumers can follow. The compost that I produce throws off a lot of heat as it converts. I wonder if I couldn't get to tomato temperatures by using a hoophouse on a few feet of compost. There are tables and planting schedules for their farm, as well as the general layout and the size of various fields and structures. It also has pictures of the packaging and talks a bit about what sells and what doesn't. That sort of information is hard to come by. Finally the book talks about tools and jigs to make planting easier, and I found that discussion to be pretty useful. For anyone considering building a hoophouse I'd say this is a useful book, and it certainly has made my seed-catalog perusing more interesting. I had to dig out my rain suit, that is. Full on raingear today; boots, bib overalls, top and lots of warm clothes underneath. Blustery and rainy. No matter where you live, if you break the all-time record for rainfall, you know its a big day. 2 inches of rain fell today at the airport in Seattle. I don't have a figure at my farm, 30 miles north, but I have several feet of water in low areas on my pasture. The rain gauge at the airport just confirmed that this was the most rain ever recorded on this day for as long as records are kept. I sure know that it was raining hard. The sows were really funny; they had made little hollows in the field, and those were rapidly turning into swimming pools. Now its not all that cold -- 40-50 degrees -- and a big sow or boar has a lot of insulation -- think walrus, or maybe elephant seal. Lots of blubber, so they'll lay out in the rain and pretty much ignore it. The people who don't ignore it are the folks on the highway. They always call animal control, and I just didn't feel like seeing officer barber so I was out in the muddy field herding the sows into the hoop barn for the night. I left the gate open so they can go out into the mud tomorrow, and they will, but people don't seem to be bothered as much by pigs walking around in the mud as they are with pigs sleeping in the mud. I feel better with the animals in shelter anyway -- I like to think that a farmer can make better choices than the animal can, at least sometimes. If all of those things happen I'll be at risk for flood. River levels for the river that will flood me if it does flood. The snohomish county health department has been an annoyance for most of a year now. Kathy Pierson on the left. 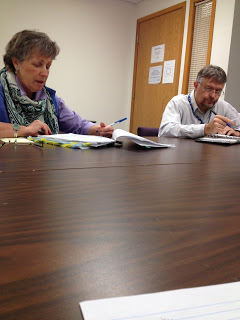 Her supervisor on the right. This all started because I hired a guy to do some work on my farm. For a variety of reasons, he didn't work out, and when he left he took some of my tools and equipment with him. I ended up having to sue him to get my stuff back. He did return my stuff, by the way. While this was happening, he was busy complaining about me to various government agencies, and leading them on tours of my property during working hours. It's bad enough that he wasn't doing the work he was supposed to be doing, he's actually actively trying to create problems for me. He was complaining about me defaming him, too. What's funny about that is that the legal folks asked him what, if anything I said about him was untrue? In any case, the snohomish health department has been on my case ever since. Kathy Pierson has continued to send me notices and letters demanding that I do this or that, expanding her area of interest from her original complaint, "improper handling of solid waste" to anything else she can think of. Here's the final letter I sent her, which basically says "I'm tired of dealing with you. Please write me a citation and I'll see you in court". Regarding your letter dated Oct 17th. I have reviewed the video recording that we made of the entire site visit on July 24th, 2012, and while you do mention manure, the complaint that we were addressing was one about feeding fruits and vegetables to pigs, not manure handling. In this recording, you state that your concerns about the feeding was resolved, and that the complaint was closed as far as you were concerned. While you do mention manure, there is no discussion at all or any agreement by any party about anything to do with manure. Every property that has animals on it has manure of one sort or another. Is it now the policy of the Snohomish County Health District to regulate every farm in this county, every horse owner, every goat owner, every chicken owner and to require manure management plans of some sort from each, no matter how small? If you believe that my operation is violating a law or rule, I would like you to cite the specific regulation or law, the location and nature of the violation, how you determined it was a violation and any proof that you have that shows that violation. For each, I would like you to detail what you propose we do to come into compliance. On receipt of that information I will take appropriate action. Let me be clear: I intend to take no action of any sort related to my farm plan, as I am now concerned that whatever is done will not resolve whatever issues you are now trying to bring up. I will not implement any change, nor will I make any comment or respond in any way until you make a complete list of any and all violations that you are concerned about; doing so would be counterproductive and probably won't resolve whatever new concerns you might have. At this point this enforcement action appears arbitrary and capricious and not based on any complaint received. The original complaint had to do with my dumping fruits and vegetables on the ground, and letting the pigs eat it. I'd then throw down a layer of wood chips, and then feed another batch of vegetables on top of that. The pigs mixed the materials up completely, and they'd compost pretty effectively. Once I'd done that for a while. I'd plant a crop on it, or move the resulting topsoil into my greenhouse and use it there for planting. The picture above is from a farm pretty close to mine. There are vegetables lying all over the ground at this farm. Some are rotting. There are thousands of these. Tens of thousands. So the basic concern that she's coming to me with, at least originally, is that I'm putting fruits and vegetables on the ground. Kathy, look at these pictures. Would 50 tons of pumpkins on the ground be "improper handling of solid waste?" Would it be that if I turned my pigs loose into this field and let them eat them? How about if I went and got these pumpkins and brought them back and fed them to my pigs? I'm sending a link to this post to Kathy, in the hopes that she'll understand that vegetables, in all sorts of different states -- fresh to rotten - are on the ground at farms every single day all over the country. Some have been disc'd into the soil. These pumpkin shreds cover at least 10 acres. Now this farm, the one in the pictures, is a conventional, modern farm. They don't have any animals at all. It used to be that the way you dealt with this, to get more value out of it, is to turn animals loose on it to eat as much as they could. Cows, pigs, goats, sheep... They'd return the material to the field in the form of manure, and you'd get some extra value out of it. Modern farming doesn't involve animals in any way. They leave this stuff in the field and then till it in, to compost there. There was a 10 acre corn field that wasn't harvested, either. I don't understand why they didn't, but this sort of thing kills me. I'd love to turn some hogs loose on that field, or some cows. good fodder. Why waste it? Summary: Kathy herself, and the entire Snohomish County Health department, has been acting like my feeding fruits and vegetables to pigs is unique, novel and ... illegal. Have any of these guys been to a farm, or is their agricultural experience limited to the produce aisle and meat case? I've been seeing a lot more coyotes this fall than I have in the last few years. This dog was out looking at a neighbors property this morning when i left the house. They keep a few chickens, and I'm guessing that it could hear/smell the chickens and was trying to figure out the best way to go get a chicken dinner. It's fairly rare to see them stand out in the open like this, and I'm wondering if this particular dog was challenged in some way. the fur on its tail and hindquarters looks pretty mangy. Usually by this time they're in their full winter coat. I don't shoot them out of hand, but I did talk to the neighbor and let them know that a 'yote was casing their joint. They have a couple of small dogs as well as the chickens, and a hungry 'yote will eat most anything it can catch. I haven't gotten the coyote that is killing my sheep yet. I lost another ewe this morning -- my farm and my house are miles away, so the two coyotes are not the same dog. If I'd seen a coyote on my farm this morning, there wouldn't be any decision at all; I'd shoot it. Had to put her down, the wounds were too severe for me to treat. Real shame. Nice ewe, nicely pregnant. 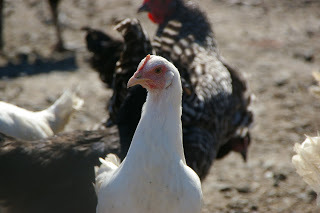 The folks over at thoughtful food blog have 11 pastured turkeys to sell for thanksgiving. If you're looking for a truly pastured, hand-raised, local bird, these are the real deal, folks. * I'm not compensated in any way for this; I just think that they've done a great job with their turkeys and I'd love to see them sell every single one. Ever thought about what you'd do on your farm if something big and bad happened? I talk about what I'd do in this post. Every year between November and February I have I have to stick very close to my farm, and make sure that everything is in working order - all of the trucks are fully fueled, and the trailers are all in good condition, and the tractors and other equipment is in working order, because every 10 to 15 years the dike fails. And this year is no exception. But I've had an object lesson in preparedness in the form of Hurricane Sandy, which didn't happen anywhere close to here at all. But it did make it clear what you might expect from a regional disaster - like a major earthquake, for instance - and what the conditions might be. Electricity completely out for 4-6 weeks. Gasoline/fuel shortages -- first, no fuel to be had at all, and then, weeks later, rationed fuel. Basic services completely gone for 2-3 weeks for wide areas. No municipal water. No supermarkets. No cell phone service. No phone service at all. In other disasters, looting and rioting have been a problem, but in this one that hasn't happened; so I can't add that to the list. 100 gallons of diesel fuel - at normal consumption rates, that's about 2 weeks supply for all of my farm vehicles and generator. 30 gallons of propane. Cooking fuel, runs the forklift, and in a pinch can be used to heat buildings or water. I don't have a good way to store water; but my property doesn't have a shortage of it. I do need a way to filter it and purify it -- or at least make it safe for drinking, so I keep 15 gallons of bleach on hand to do the job. It's cheap, and I replace it every year. Works as a good sanitizer too, when cleaning equipment or dishes. In the event of a flood I'd expect there to be water everywhere and that all of it would be contaminated with sewage or spills of all sorts. Food is a bit of a problem - animal food, that is. My 300 pigs eat quite a bit of food. In the event of a major earthquake, for instance, I'd expect my food supply chain to be completely disrupted, and that it would take some time for it to be put back into order -- food for animals is less important than that for people. So the basic plan is to shoot and salt (no refrigeration, remember) most of the pigs. Towards that I have 800lbs of salt, and I've seriously considered keeping a ton of salt on hand. It's cheap, it doesn't rot, and salt pork was a staple travel food for centuries - I'm pretty sure that I could trade it for whatever I needed. In fact, if you're interested in salt pork, you'll find a video for traditionally prepared salt pork here. The number of pigs saved would depend on the situation, but ideally you'd save all of the pregnant sows you could, and at least one boar. You can repopulate pretty quickly with pigs. With the ruminants, it all depends on how much hay I have on hand. Cows and sheep can and do feed themselves off the land -- and I'd be inclined to try to save as many of those as I could, particularly if I thought that the event might be long term, say 3 to 6 months or longer. 3 to 6 months? Does that seem long to you? It sure doesn't to me. A major earthquake, nuclear or volcanic event (we have all three possible here in Washington State) could result in permanent changes. Look at the area around mt. St. Helens, for instance, more than 30 years after the event. Or the areas hit by the tsunami in Japan. Or Fukishima. What I'm talking about here is farm-level preparedness. Do you think about this, or what might happen? Halloween! Well, not really. After halloween!! Ever wonder what happens to all those pumpkins that don't get sold? Well, here's what happens to some of them. We recycle them. We get truckloads of them at this time of year, maybe 30 tons of them, and feed them straight to the pigs. If you look in the picture above, you'll notice some green squash -- those are hubbard squash. We usually get an assortment. We glean these vegetables directly from the farmers field -- whatever doesn't get picked up gets plowed back into the field, and I've always thought that was a shame. Seems a lot better to pick them up and use them for feed. I'll compost them, too -- I'll just put it through a pig first! As I've mentioned before, the pigs will bite a hole through the side and then mine out all of the seeds right away. You can see a pumpkin in the lower right hand corner that's been cleaned out,and this sow is working on another one. Whole pumpkins are a seasonal treat for our pigs, and it's one of the reasons I look forward to fall.